Six days after cyclone Nargis tore through Burma, Mya Hen wandered the banks of the Irrawaddy River, searching for firewood. As he picked up kindling scraps, he barely glanced at a pair of bloated bodies splayed on the riverbank. Death is so pervasive in the delta now, what are two more corpses? Like hundreds of villages across the delta, almost all the bamboo shacks in Mya Hen's hamlet of Phya Chaung, near the town of Bogalay, collapsed under the force of a massive tidal surge triggered by the storm. No one is sure of the death toll, but if other nearby villages are any indication, at least half of the residents perished. "I was lucky to have survived," Mya Hen says. "But now I have nothing left. No food, no water, no home. What will I do?" Hundreds of thousands of Burmese are asking the same thing across the vast Irrawady delta, the country's rice bowl. Nationwide, the Burmese government estimates that more than 22,000 lost their lives. 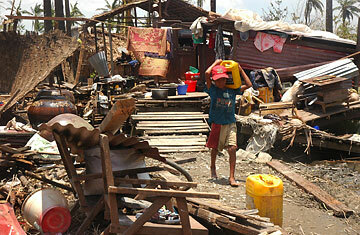 For the people who survived the cyclone's wrath, there is little time to grieve. Makeshift huts must be constructed, drinking water procured. And in at least five villages along the Irrawaddy, residents say that not a single government official has come to assess the damage or bring relief supplies nearly a week after the May 2-3 storm abated. Than Maw, who says some 400 people in her village of Aung Hlai Myintan were killed by the storm, spends her day combing the riverbank for things to salvage. Rumor has it that someone in a nearby village found a piece of gold lost in the storm. But Than Maw isn't saying whether she has found anything herself. Nine people, she has heard, were killed in a village across the river by hungry looters. By Thursday, a few government trucks were ferrying water and medicine to the delta from the commercial capital of Rangoon, which was also hit by the cyclone. But a few dozen trucks will do little to allay the vast destruction. In Bogalay, once a prosperous trading port, one third of buildings have collapsed. At a jetty along the Irrawady, two nearly week-old bodies, an adult and a child, lay among the storm's detritus of plywood, bamboo and coconut husks. Near the corpses, people went about their lives, tying bamboo poles together to build temporary lodging and jostling for limited supplies of cooking oil and diesel fuel. Prices have at least doubled, a further blow to people who lost all their savings when Nargis swept through. Although Burma's ruling military junta has been criticized for not adequately warning citizens about the approaching storm, locals conceded that government radio had announced that a cyclone was approaching. Rangoon's iconic Shwedagon pagoda, for example, was closed on the afternoon of May 2 because of the cyclone. But there has never been such a destructive storm in living memory in Burma. Nearly everyone ignored the government warning and went to sleep as usual in their flimsy shacks that night. By 9 p.m., delta residents realized this was no normal storm. Ei Phyu Aung, a 14-year-old girl, recalls her house suddenly floating away in what locals estimate was a twelve-foot wave. She slipped out a window and grabbed onto a coconut palm. By mid-morning the next day, the water had washed away her clothing but she held fast to the tree. "The people who held on to trees survived," she says, showing the oozing abrasion on her arm from her ordeal. "Those who didn't, died." Many of the survivors have taken refuge in nearby monasteries and schools. By late week the government has sent buses to take survivors to larger towns further inland. But many refugees were unwilling to leave their locality for camps where disease can spread quickly. Late at night, deep in the delta, a convoy of 13 buses headed back empty to the town of Maubin. No one had taken the military's offer of shelter. But in the town of Kyaiklat, 12 camps were full, each teeming with around 2,000 refugees. Ma Sein and her four children were holed up in a monastery. The widowed mother lost everything, save the clothes on her family's back. "I have nothing left," she says. "My children are my only savings." Inland in the village of Thar Yar Wae, only three of the village's 369 buildings survived the storm. Still, residents feel lucky because no one died. Now they are waiting for government officials to come and talk about whether there are enough funds to help rebuild the school and nearby monasteries. But village chief Ohn Hwe already knows the answer. "There will not be enough money," he says. "There never is."